Many liquefied gases cool dramatically under even moderate flow conditions due to the heat of vaporization when the liquid is converted to gas. 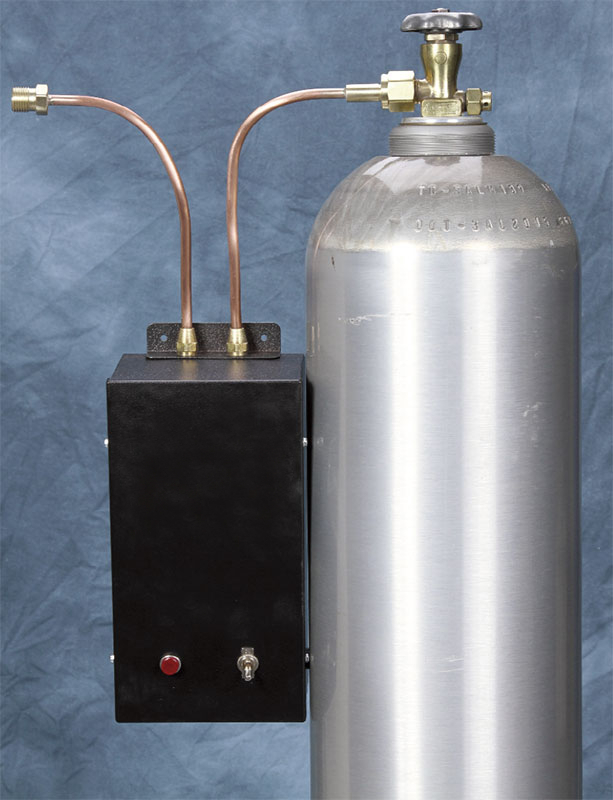 This effect causes "freezing" in pressure regulators and other equipment resulting in pressure and flow fluctuations. These thermostatically controlled heaters maintain a constant temperature within close limits regardless of load variations, thus assuring a uniform temperature and constant gas flow at all times. All units are completely automatic and can be left on indefinitely, even under no-flow conditions without damage. Double protection against thermal or electrical overload. Continuous high pressure tubing –no internal joints. Working pressures up to 4600 psig. Completely dry - heat exchange medium is aluminum. Heavily insulated - cabinet remains "cool." Can be left on, even under no-flow conditions. Unlike ambient devices, not affected by adverse atmospheric conditions. Flow can be in either direction, without loss of efficiency. One year guarantee on material and workmanship. ** Capacities for other gases will vary, depending on their specific heat. Other fittings available on request.